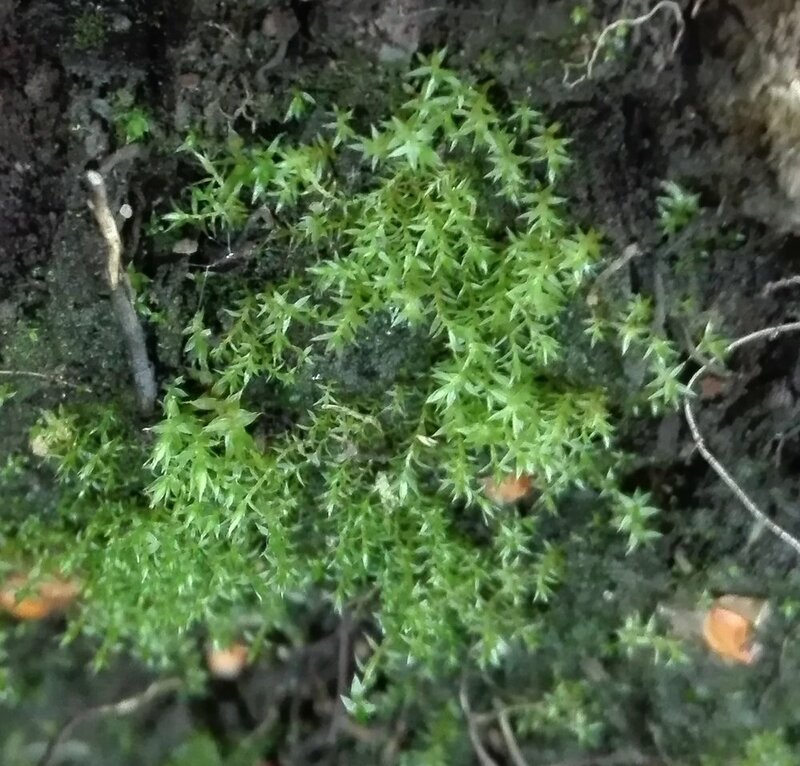 Dry days in summer weren’t the best time to study mosses, but now the air is damp the mosses are coming into their own, so why not have a proper look at them. (There’s also not so much else going on out there to distract me). Have to say that I found identifying these mosses pretty difficult, especially as most do not have sporophytes at present, but searching around to see how many different kinds I could find was fun. Hopefully the IDs are mostly correct? I concentrated on those at ground-level, growing on rocks, walls and of course taking over the lawn. Two kinds of Feather-moss are widespread; Rough-stalked Feather-moss (#68, Brachythecium rutabulum) grows in dense clumps on some rocks and bricks around the site, whereas the Common Feather-moss (#381, Kindbergia praelonga) prefers either the lawn or peaty compost in a neglected planter. Wall Screw Moss (#382, Tortula muralis) grows on the limestone rocks around the edges of the lawn and Silver Haircap (# 385, Bryum argenteum) is widespread in cracks between paving slabs. The next two species are more restricted around the garden: Dwarf Haircap (#384, Pogonatum aloides) is established in undisturbed potting compost in a large planter, while Lesser Bird’s-claw Beard-moss (#386, Barbula convoluta) is restricted to growing on the shady end of one of the railway sleepers around my raised vegetable patch. This seems quite a good selection of mosses; there’s also Redshank Moss (#273, Ceratodon purpureus) up on the roof, and another check of the mosses up there is probably in order some time. Checking the mosses as they develop during the year may lead to me finding more, or maybe (I hope not) reviewing identification of the ones I’m showing here. There are many, many more mosses out there that could turn up.